You’ve heard about a decline in TV viewership, but these numbers say otherwise. There’s always been a common saying that live sports are recession-proof. No matter the number of people who are cord-cutting, you can’t replace the drama and excitement of watching a live sports broadcast. While there has been a drop in ratings across the board for nearly all of television, sports hasn’t felt the impact of other network and broadcast programming. NFL ratings took a dip in the 2017 season and 2018 playoffs, but football is still king in the United States, and the NFL accounted for the top seven most-watched sports broadcasts. In all, 38 NFL games made the top 50 most-watched sporting events on U.S. television while the Winter Olympics accounted for nine broadcasts. College football took up the other three spots, meaning the NBA, MLB and World Cup were all left out. Additionally, no games from March Madness, the Masters or Kentucky Derby cracked the list. However, 2018 being an Olympic year skewed the results. Without the nine Olympic nights, many of those aforementioned events would have made it. In 2017, which was a non-Olympic year, 40 of the 50 top sports audiences were NFL games. In the last Olympic year of 2016, just 33 of the top 50 most-watched sports broadcasts on U.S. television were NFL games, so the league appears to be on the rise once again. How many of these sporting events did you watch? Scroll through to find out. Note: All figures are courtesy of SportsMediaWatch.com. The figures for all of the Olympics broadcasts include the prime-time viewership on both NBC and NBCSN. Night 6 was No. 6 in terms of most watched Olympic nights at the 2018 Games. Despite peaking at over 20 million viewers at one point, the ratings were not on par as compared to the first Thursday night of previous Olympic Games. Counting both Summer and Winter Olympics, the television ratings from this first Thursday of the Olympics were the lowest since at least 1992. But still, you have to keep things relative and the audience for this night was the biggest of any Thursday night since the 2017 NFL Kickoff Game some six months earlier. After seven months of no football, fans were starved for the return of the NFL, and not even a delayed start could stop good ratings for NBC. This was the most-watched sporting event since the Olympics, and it topped all games from the NBA, the World Cup and the opening week of college football. The game was delayed an hour due to weather, which may have prevented even better ratings, since kickoff wasn’t until after 9 p.m. EST, and the game ended after midnight on the East Coast. The game came down to the final play, but Matt Ryan and Julio Jones were not able to connect in the end zone for a game-winning touchdown just as they weren’t able to do so in the NFC divisional game (No. 10 on this list). Despite being the highest-scoring team in the NFL, the Chiefs only appeared in two games from the 2018 season on this list. The other involved Tom Brady and the Patriots. This matchup with the Seahawks also involved a Super Bowl-winning quarterback in Russell Wilson. Wilson and Pat Mahomes went back and forth in a game that had 28 points scored in the final 10 minutes. The Seahawks prevailed in the end with a score of 38-31 to clinch a playoff berth after a one-year postseason absence. With the win, Wilson became the first quarterback in NFL history to post a winning record in each of his first seven seasons. The Lions were riding a seven-game losing streak on Sunday Night Football prior to this game and had not won since 1999. But they upset the Patriots as the pupil, Lions coach Matt Patricia, got the best of the teacher, Patriots coach Bill Belichick. The Lions earned the victory with a stout defense that held the Patriots to 10 points and a run game, which had been dormant for quite some time. Rookie Kerryon Johnson rushed for 101 yards, becoming the first Lion to reach 100 yards in five seasons. That stretch of 70 games without a 100-yard rusher was the longest since the 1970 AFL-NFL merger. There’s that team again ... the Dallas Cowboys. This entry has two unique things about it. First, the Cowboys-Colts game was in the early window for Fox. Every other Sunday NFL game on this list was either on "Sunday Night Football" or aired in the late window, which traditionally attracts more viewers. This game started at 10 a.m. on the West Coast (which has plenty of Cowboys fans) and still managed to land on this list. The other unique thing about this game is that it beat every prime-time game of the weekend. SNF, MNF, TNF and even two Saturday games couldn’t top the Cowboys (and the Colts). The only other game from Week 15 to top this game was the Patriots-Steelers game played in the late national window. Depending on how Dallas’ season shakes out, this game may end up being the defining one of their season. They were coming off a Monday Night Football home loss and playing on a short week while the Eagles were coming off a bye. But the Cowboys controlled this contest and never trailed. Of the three Sunday Night Football games involving the Cowboys, this one came in second in viewership, beating the game against the Texans in Week 5 but not measuring up to the Week 2 game against the Giants. The second 2018 matchup between the Packers and Vikings had a different result than the first one, which ended in a tie. This time, Minnesota won 24-17. It marked the fourth straight game in the series that Green Bay did not win, their longest winless streak in the series since the late 1970s. The game was the fifth in Week 12 to land on this list, although that is boosted by the fact that Thanksgiving fell in Week 12, and all three Thanksgiving games were among the top 50 most-viewed sporting events of 2018. The Olympics always has relied on big stars to draw in viewers, and that’s what Night 11 provided to American fans. Lindsey Vonn competed in the final event of her Olympic career and bronze in the women’s downhill. Vonn being a household name made Night 11 the first night of the 2018 Games to earn a higher TV rating than its 2014 counterpart. The two highest markets in terms of ratings were Denver, Colo., and St. Paul, Minn. That makes sense. Vonn was born in St. Paul and now lives in Vail. Many thought that Drew Brees would throw for 400-plus yards in this game and break Peyton Manning’s all-time passing record in front of his brother, Eli. But the Saints leaned on Alvin Kamara, who had 181 yards from scrimmage and three touchdowns. This game checked in as the sixth and final game involving the Saints to appear on this list, trailing only the mighty Dallas Cowboys, who had eight. On the other hand, the Giants, who are the more popular team in the country’s biggest market, appeared in just two games on this list thanks to their woeful record. If Aaron Donald does end up becoming the third player in NFL history to win the MVP award, this game may end up being his showcase game because he lived in the Seahawks’ backfield. Donald had 2.5 sacks, 3.5 tackles for loss and five quarterback hits, including two on the last drive which sealed the victory for Los Angeles. The viewership for this game looks even better when you take into account that this game was broadcast to just 76 percent of the country. The rest of the country was split among three other games. Washington’s 20-17 victory ended the Cowboys’ four-game win streak in the series, the longest since Dallas won 10 straight in the late 1990s/early 2000s. The game was decided at the end when the Cowboys were attempting a 47-yard field goal to send the contest into overtime, but were whistled for a snap infraction. The refs said the Cowboys’ long-snapper illegally moved the football, so they then moved the ball back five yards after the flag. Dallas then missed the 52-yard attempt and lost the game, leaving their long-snapper dumbfounded. "Exact same thing I've been doing for 14 years," L.P. Ladoceur said about the infraction that drew a flag. Just like the rematch of the NFC championship game (No. 34), the rematch of the AFC championship game had a different result than the playoff matchup. The Jags took down the Patriots 31-20 and had everyone thinking they were Super Bowl contenders, although they later revealed themselves to be contenders for the No. 1 pick in the 2019 draft. This game was Tom Brady’s first-ever loss to Jacksonville after winning the first five matchups. The Jags were the only AFC team that Brady had never lost to. Now the only five teams that Brady has never lost to all reside in the NFC. The Giants-Cowboys matchups usually are ratings gold for whichever networks broadcast the games. This Week 2 contest produced enough viewers to land on this list, but it also was the least-watched matchup between these rivals in eight years (counting only prime-time games). Of the 35 Giants-Cowboys games since 2001, regardless of window, this game clocked in as 22nd in viewership and 25th in ratings. Of the 21 million viewers for this game, 34,000 were via streaming services, and that was the difference between this game jumping ahead of the Patriots-Jags game (No. 36), which took place earlier in the day. A rematch of the NFC championship game nine months earlier went the opposite way this time as the Vikings were road victors. This meeting between the teams had exactly half the viewership of their playoff game, which checks in at No. 3 on this list. In this game, the Vikings jumped out to a 20-3 lead before the Eagles made a game of it and got within two points with one minute remaining. However, Philadelphia failed to recover an onside kick attempt, giving them a loss for the second week in a row and their first two-game losing streak since 2016. Week 17 of the 2018 NFL season was loaded with games with massive playoff implications, but this was the only one to make the top 50. All the Vikings had to do was win, at home, against a Bears team which knew they were locked into the No. 3 seed by halftime. But the Vikings laid an egg, Kirk Cousins had (more) people question his contract, and the team will be watching the playoffs along with millions of others. Week 17 had one win-and-in game — the Sunday Night Football contest between the Titans and Colts. Indianapolis pulled out the road win, but just 16.05 million people watched that game, making it the fourth most-watched game of Week 17. Alabama was a controversial selection over Ohio State for the final spot in the College Football Playoff, but the Crimson Tide proved they belonged by thrashing the defending champions. This game doubled as the Sugar Bowl and was Part III of the Alabama-Clemson rivalry — whoever has won the game has won the national championship. Both this game and the other CFP semifinal, the Rose Bowl, aired on New Year’s Day, which isn’t an ideal broadcast time. But the 2017 semifinals aired on New Year’s Eve, an even worst time, and as a result, ratings for the 2018 semifinals games were up 26 percent compared to the previous year. A possible AFC championship game preview lived up to the hype as the Chiefs and Patriots battled it out to a 43-40 victory for New England. This is the only game in NFL history to end with that final score, and it gave the Chiefs their first loss of the season. The most exciting part of the game came at the end as the fourth quarter had four lead changes/ties. Most people think of Boston as a "baseball town," but market ratings say otherwise. Boston had a 34.3 rating for this game while a competing Red Sox ALCS playoff game posted just a 20.6 rating. Aaron Rodgers calls Los Angeles home during the offseason, but he calls LA “daddy” during the season as he’s never won in the city (0-3 record) dating back to college. Rodgers and the Packers had a chance to hand the then-undefeated Rams their first loss of the season, but a late fumble by Ty Montgomery, which led to the trade of Montgomery, kept the Rams’ record perfect. This game in the LA Coliseum ended about 30 minutes before Game 5 of the World Series which took place six miles away at Dodger Stadium. The LA team wasn’t as successful in the baseball game and the World Series clincher also failed to match a Week 8 NFL game as Game 5 had a viewership of 18.45 million. Despite airing in prime time, the third and final NFL game on Thanksgiving always lags behind the other two games in terms of ratings and viewership. Still, though, this was the most-watched Thursday Night Football game of the season until it was topped a week later by Saints-Cowboys. This game was the 100th all-time matchup between the Saints and Falcons, and New Orleans closed the gap in the series with its 48th win compared to 52 for Atlanta. The most interesting part about the ratings for this game was that the New Orleans market posted a 75 share, meaning a whopping three-fourths of all TVs in use in the city were tuned into this game. A potential NFC conference championship Game preview played out in Week 9 as the Rams went into New Orleans undefeated, but left with their first loss of the season. New Orleans jumped out to a 35-14 second quarter lead before the Rams reeled off 21 straight points to tie the game in the fourth quarter. New Orleans then scored 10 straight to seal the victory with the last score punctuated by Michael Thomas’ flip phone touchdown celebration. Of the 11 NFL postseason games, this one was the first one played and the last in viewership. That is despite it being just a one-point game and Tennessee’s first postseason appearance in nine years. The Chiefs led 21-3 midway through the third quarter before Tennessee ran off 19 straight points to pull out the road win. The 18-point deficit that Tennessee overcame was the biggest postseason road comeback in 45 years while the Chiefs lost their sixth consecutive home playoff game, extending their own dubious record. The storyline heading into this Week 3 contest was Seahawks’ All-Pro Earl Thomas’ infatuation with his hometown team of the Dallas Cowboys. After the teams played in 2017, Thomas ran down Cowboys coach Jason Garrett and expressed his desire to one day be a Dallas Cowboy. Thomas certainly gave a great audition in the game as he had two interceptions in a 24-13 Seattle victory. The 12.7 rating that Fox garnered for this game is even more impressive considering they had unusual competition for a fall Sunday. This game went head-to-head with Tiger Woods winning his first PGA tournament in five years courtesy of the Tour Championship on NBC. With one team riding a 10-game win streak and the other team being the Dallas Cowboys, Fox and the NFL Network were destined for great ratings. The Cowboys’ upset of the Saints was the third most-watched game in the history of the Thursday Night Football series, which dates back to 2006. Outside of the three NFL games on Thanksgiving, this is the only other Thursday football game to make the list. The 22.2 million viewers were nearly five million more than any other TNF game in 2018. X-Games fans already were aware of Chloe Kim before the Olympics — she had won four gold medals at the Winter X Games. But a national audience was introduced to the then-17-year-old when she claimed gold in the women’s halfpipe during Night 3 of the PyeongChang Games. Coincidentally, the biggest quarter hour of viewership came during Kim’s event as nearly 27 million people tuned in to watch her performance. Viewers also saw the Olympic Athletes from Russia, who competed under the neutral Olympic flag, receive bronze medals in both the men’s and women’s individual sprint events of cross-country skiing. The good news for NBC is that their 2018 Sunday Night Football season premiere was watched by enough people to land on this list. The bad news for the peacock network is that their 2018 SNF opener was the least-watched kickoff game in a decade. Not even the dramatics of Aaron Rodgers exiting early with a knee injury, only to make a triumphant return and lead a comeback, could boost viewership. This game didn’t attract the national audience that NBC would have hoped for, but their local affiliates made off nicely. Milwaukee led all markets with an astounding 49.6 rating, meaning nearly half of all TVs in use were tuned into this game. Chicago had the second highest market at 35.3. Night 4 brought out, perhaps, the single biggest American name in the Winter Olympics: Shaun White. After failing to medal at the 2014 Games, White won his first Olympic medal in eight years as he won the men’s halfpipe for the third time. White’s third career Olympic gold medal also was the United States’ 100th Olympic gold medal at the Winter Games. It’s no coincidence that viewership peaked during the quarter-hour in which White made his final run as 28.2 million people tuned in at that time. The Falcons-Rams playoff game coming in at only No. 23 had to be shocking for NBC, which aired the contest. Among playoff teams, Los Angeles ranked first in market size while Atlanta ranked third, yet this game still ended up as the second least-watched NFL postseason game. This was the first playoff game in Los Angeles since 1994, so the locals were stoked, but it didn’t catch on with a national audience. This was the only game of wild-card weekend that aired in prime time (Saturday), yet it was the lowest-rated among the four. Some pegged this game as a possible Super Bowl preview when the schedule first came out, but you wouldn’t know it from watching the Vikings this year. However, the ratings still held steady as they usually do whenever Tom Brady is part of the action. Fox had to be thrilled that this game wasn’t flexed into Sunday Night Football as this is the only game of the season that the Patriots will be on their network. Since the Patriots are in the AFC, which has a contract with CBS, the only time New England plays on Fox is when an NFC team visits Gillette Stadium. That happens just twice per year, and the other instance fell in NBC’s lap as the Packers played at New England on SNF in November. You expect Week 1 NFL games to deliver good ratings, and that’s exactly what Fox got in the national window of their doubleheader, even though this game aired in just 80 percent of markets. It certainly didn’t hurt that the ratings-juggernaut Cowboys were one of the teams. No one moves the needle quite like Jerry’s boys. The NFL may have been worried that the final score of 16-8 was a sign of things to come, but this low-scoring, defensive affair proved to be an outlier for the points-galore 2018 NFL season. 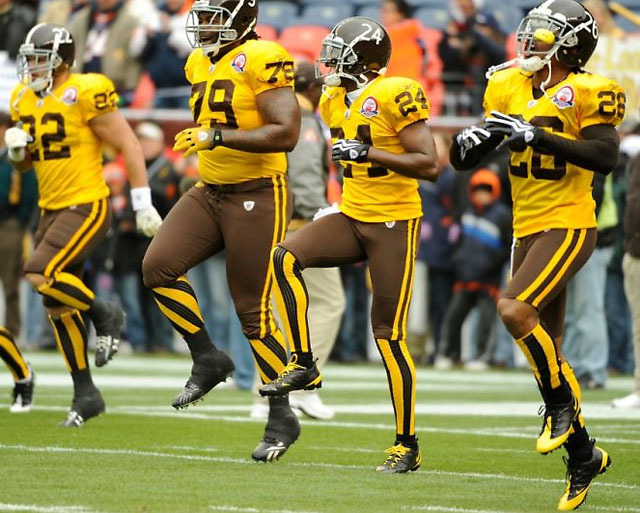 The Broncos and Steelers have engaged in some memorable contests such as the Tim Tebow playoff game and the Broncos’ hideous uniforms game. This matchup wasn’t on the level of those two, but it was an exciting affair in which neither team ever led by more than seven points. It had everything from a kicker throwing a touchdown pass to an offensive lineman catching a touchdown pass to Big Ben and JuJu Smith-Schuster hooking up on a 97-yard score. The game-sealing play for the Broncos came on another oddity: a 300-pound nose tackle, Shelby Harris, picking off Ben Roethlisberger in the end zone to preserve the victory. In the matter of seven days, the Steelers went from the high of finally knocking off the Patriots to the low of fumbling away a potential victory in New Orleans. The Steelers had a lead in the fourth quarter but committed two costly fumbles, and the Saints rallied to win 31-28. The win locked up home-field advantage through the playoffs for New Orleans and the loss left Pittsburgh on the outside looking in for the AFC playoffs. With the help of a Michael Jordan GOAT promo, the second-ever meeting between Tom Brady and Aaron Rodgers delivered for NBC. While the game was somewhat underwhelming, the broadcast was the most-watched NFL game of the season, up to that point, and also the most-watched program since the Academy Awards in March. The viewership was nice, but NBC may have been a little surprised that this game couldn’t match the first meeting between Brady and Rodgers. In the 2014 season, the two squared off, in a Sunday afternoon game no less, and over 30 million tuned in to watch a 26-21 Packers victory. Redmond "Red" Gerard became a household name during the first official night of Olympic events by winning the men’s slopestyle event. Gerard, who was 17 years old at the time, became the youngest American to ever medal at an Olympic snowboarding event. Viewers also saw the Norway cross-country skiing team complete a podium sweep as they claimed all three medals in the men’s skiathlon event. The markets which topped the ratings for this night of the Olympics were, unsurprisingly, ones where these types of events are most popular. Salt Lake City had a 24.5 rating while Denver was second with a 22.7 rating. Of the markets that finished in the top 10, seven of them are in the Pacific or Mountain time zones and none of them came via the Eastern time zone. If you take out Cowboys games and the Thanksgiving games, Week 15’s matchup of the Patriots and Steelers stands as the NFL’s most-watched game of the 2018 season. The game, itself, matched the viewership as the Steelers beat the Patriots after losing five straight in the series. But showing how times have changed, despite this game being one of the most-watched games of the season, it earned the lowest rating of any national Week 15 game since the 2006 season. The Patriots and Steelers also played in Week 15 of the 2017 season, and that game posted a better rating (15.2) and more viewers (26.88) than 2018’s game. This Week 14 matchup being the highest-rated Sunday game of the season seemed laughable to anyone who watched the first three quarters. The game was a field goal-fest, and the score was 9-6 entering the fourth quarter. Then, all hell broke loose, and 37 points were scored in the fourth quarter and overtime, capped off by an Amari Cooper walk-off touchdown. This game was the third most-watched regular-season game of 2018, trailing only two Thanksgiving games. The NFL really couldn’t have picked a worst postseason matchup in terms of two teams in the same conference. Buffalo and Jacksonville are the two smallest TV markets in the AFC, and their teams combined to produce one of the dullest postseason games in recent memory. The Jags won 10-3 in what was the lowest-scoring playoff game in 37 years. Even the fact that the two teams had gone a combined 28 seasons without a postseason appearance couldn’t save this game but, surprisingly, it wasn’t the lowest-rated NFL postseason game. The first Sunday night of the Olympics traditionally attracts the biggest audience outside of the Opening Ceremony. This year, it was no different, even though the audience was the lowest for the first Sunday of any Olympics since 2006. With Pyeongchang 14 hours ahead of the East Coast, events that happened on Monday morning/afternoon in South Korea actually aired during prime time on Sunday in the United States. The highlight of this night was American snowboarder Jamie Anderson winning gold in the slopestyle event. Anderson also won gold in the same event in the 2014 Games, which made her the first female snowboarder to win multiple Olympic gold medals. Many people think that the Cowboys have tenure when it comes to NFL Thanksgiving games, but it’s the Lions who have playing on the holiday since 1945 while Dallas has hosted annually since 1978. But the Cowboys do get the afternoon window on Thanksgiving, and the Lions’ games start at 9:30 on the West Coast. Thus, it comes as no surprise that the viewership increased as the Bears-Lions game went on and peaked in the last 15-minute window. The loss to Chicago gave Detroit a 37-40-2 all-time record on Thanksgiving. The Lions have just six more wins than the Cowboys on this holiday despite playing in 28 more games. Not even Tom Brady and the New England Patriots are immune from poor ratings. This contest was the lowest-rated Brady postseason game in over a decade. The Titans scored the first and last touchdowns of the game, but New England scored five touchdowns in between for a 35-14 victory. The 16-year age difference between Brady (40) and Marcus Mariota (24) was the largest in postseason history for starting quarterbacks, and the loss cost Titans coach Mike Mularkey his job. Mularkey and the Titans parted ways two days after this game, which makes him the only NFL coach who made the playoffs in 2017 but was not retained in 2018. This game doubled as the 104th version of the Rose Bowl, and the fans in Pasadena were witness to a late Christmas present on New Year’s Day. Georgia overcame a 17-point deficit to prevail 54-48 in double overtime in what is the highest-scoring Rose Bowl in the game’s history. Being the first-ever meeting between two football powers in Georgia and Oklahoma added intrigue to the contest, and ESPN reaped the rewards in the ratings. This game was the fifth most-watched cable broadcast of all time, sports or not, and now ranks sixth all-time after the CFP National Championship Game, which aired a week later. In a game that had more turnovers (two) than touchdowns (one), the Eagles used a goal-line stand to win their first postseason game since the 2008 season. With Philly leading 15-10, Matt Ryan led the Falcons to a goal-to-go situation with just over one minute remaining. But "The Birds" prevented "The Dirty Birds" from getting into the end zone on four straight pass attempts to hold on for the win. Despite the No. 10 ranking, NBC likely was hoping for even more as this game was one of three NFL postseason contests that featured two teams ranked in the top 10 in market size (Eagles-Patriots and Falcons-Rams were the others). 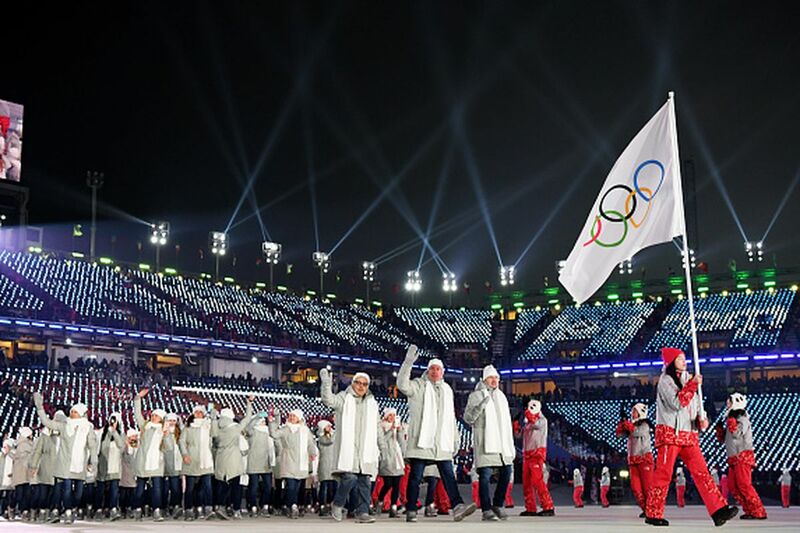 While most of the prime-time coverage of the Winter Olympics was shown live, the opening ceremony was on tape delay since it began between 3 and 6 a.m. in the U.S., depending on your time zone. Even so, the tape-delayed broadcast beat out five NFL playoff games as viewers tuned in to see a cast of 2,000 perform in the ceremony. South Korean former figure skater, Yuna Kim, lit the Olympic cauldron following the 91 participating countries walking through in the Parade of Nations. The opening (and closing) ceremonies took place in Pyeongchang Olympic Stadium, which cost $109 million to build and was destroyed once the Paralympics ended. The venue only was intended to be temporary so it hosted five events (opening and closing ceremonies for Olympics and Paralympics and a K-pop concert in 2017), then was demolished soon after the last medals were awarded. No. 8 brings us the first non-NFL game in terms of most-watched sporting broadcasts. Though with the talent on the field between Alabama and Georgia, you could probably field a competitive NFL team (18 players from both teams were taken in the 2018 NFL draft). The game was won by Alabama 26-23, and it was the first CFP national championship game to go to overtime. The only time Alabama had a lead came on the final play of the game in which backup quarterback Tua Tagovailoa found DeVonta Smith for a 41-yard game-winning touchdown pass. This game was part of ESPN’s Megacast and was broadcast over their entire family of networks. The viewership takes into account those that watched the game on any of those ESPN channels. This game was the most-watched regular season NFL game since the same matchup on Thanksgiving in 2016 (35.1 million). Over the last decade, just four non-NFL sporting events topped the viewership of the game: Game 7 of the 2016 World Series, Game 7 of the 2016 NBA Finals, the 2015 CFP national championship and the 2009 BCS national championship. This game serves as a bit of an outlier since it was the only NFL wild-card game that had more viewers than NFL divisional games. Perhaps the Panthers-Saints matchup attracted more viewers because people wanted to see if New Orleans could defeat Carolina for a third time in one year. That’s exactly what happened for the 14th time (out of 21 attempts) in NFL history as a team won two regular-season matchups and went on to win a postseason game as well. Outside of the four teams in the championship games, the Saints were the only other team to have multiple games among the top six most-watched NFL games. While the Saints-Vikings game confined its excitement to the last play, the Jags-Steelers game was riveting from start to finish. Jacksonville won 45-42 in what is the fourth highest-scoring postseason game of all time. The Jags jumped out to a 21-0 lead, but Pittsburgh clawed back and made it a one-score game four different times before falling short. Unfortunately for the NFL, the offense-heavy affair didn’t produce the ratings that the league wanted. Despite being the fifth-most watched broadcast of the year, this game tied for the lowest-rated Sunday divisional playoff game since 2002. If the excitement of one play could be extrapolated over an entire game, the "Minneapolis Miracle" would have made the NFC divisional game the most-watched sporting event of all time. The Vikings were left for dead with just a 4 percent win probability when they were stuck on their own 39-yard line with 10 seconds remaining. Down by one point, their next play call was intended to just set them up for a field-goal attempt, but it ended with Stefon Diggs in the end zone after a whiffed tackle. The "Annual NFL Honors" called it the Play of the Year as did the ESPY Awards. ESPN’s show, "NFL Live," labeled it as the greatest "walk-off" play in NFL history, and it’s not too often that a singular play gets its own Wikipedia page. The Vikings had everything going for them as they entered the NFC championship game. They were coming off the improbable "Minneapolis Miracle" and were one win away from becoming the first team to play in a Super Bowl in their home stadium. But after taking a 7-0 lead over the Eagles, Philly reeled off 38 straight points to win in convincing fashion. The 31-point blowout was the second-largest point differential in an NFC championship game since the 1970 merger. The game being decided early also impacted the ratings as it was the lowest-rated conference championship game, regardless of conference, since 2006. It’s always interesting to see which NFL championship game comes out with better ratings since it usually hinges on market size of the teams and competitiveness of the game. The NFC championship game had the edge on market size with their teams, but the AFC championship game had the edge in game excitement. Jacksonville is the NFL’s fourth-smallest market, and the Jags had no prime-time games in 2018, but they stuck with the Patriots and even had a 10-point lead in the fourth quarter. In the end, the Jags came up short, losing 24-20, while these ratings were also a little short of the 2017 AFC championship game between the Patriots and Steelers, which had a 27.4 rating. It comes as no surprise that the Super Bowl clocks in as the most-watched sporting event, though this Super Bowl couldn’t match the numbers of the previous ones. The eight Super Bowls that aired from 2010-17 are the eight most-watched broadcasts (sports or not) of all time. However, Super Bowl 52 comes in as the 10th most- watched broadcast of all time behind those eight previous Super Bowls and the series finale of "M*A*S*H."
This year’s big game did not lack for drama as Tom Brady looked to solidify his GOAT status with a victory while the Eagles went for their first-ever Super Bowl championship. In the end Philadelphia prevailed 41-33 in a game that set a postseason record for the most yards gained by both teams combined (1,151).